There are three kingdoms. the first is the Earth, ruled by the elephant. The second is the water, ruled by the shark, and the third is the air, ruled by the hawk. They coexist peacefully, each animal in their own kingdom. Then came along the people, and just as they always have, they wanted total dominion over every part of the world. (Okay, so the book says that they “needed” to have access to water and air and earth and were afraid they weren’t strong enough to face the beasts that ruled, but we adults know better…) Through cleverness and craftiness, they learn how to take control of all three kingdoms. 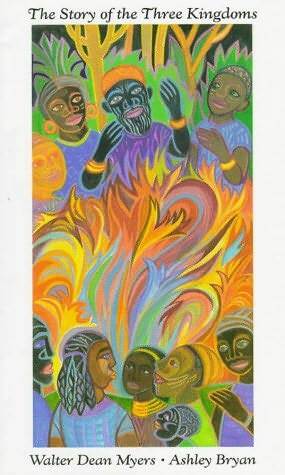 With amazing illustrations, beautiful vibrate colors, and prose that gives you the feeling of sitting around a campfire listening to an ancestor talk to you, Myers and Bryan have created a beautiful tale that would be perfect for any folk tale or oral traditions module. One theme that really stuck out to me when reading this is that wisdom is a gift that only humans possess and that storytelling is one of the most wonderful things humans can do. The rhythm of the prose is very beautiful. You can tell that this is an oral story that’s been passed down. When you listen to it being read, you can hear the cadence. You can feel the beat.